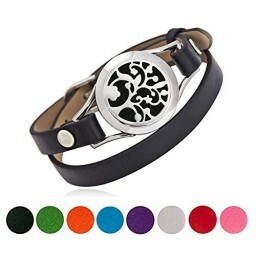 ♣ Nice Design: Nice Design: 'Tree of Life' design elegant appearance, adjustable Leather bracelet, which is perfect to fits everyone easily. 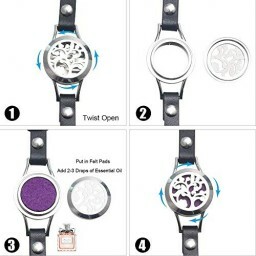 Packing Detail: 1 Diffuser Bracelet + 8 different colors washable pads. 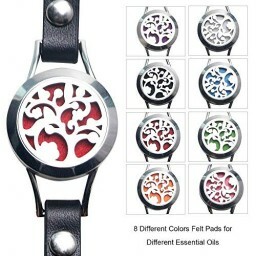 You can add different essential oils to different colors felt pads, and match different colors according to your daily wear. ♣ Function: Enjoy essential oils and the benefits of aromatherapy, make you feel relaxed and calming. You can add 3-5 drops (Depending on the essential oil) lavender essential oil to the felt pads, and the smell lasts nicely for a couple of days. Make yourself more attractive ! ♣ Durable Material: Surgical grade stainless steel + washable reusable pads+genuine leather Top primium materials. Stainless steel is resistant to rust, for long life and durability, solid and smooth, anti-corrosion, easy to clean. ♣Perfect Gifts For Women: A special gift ideas gift with good design & purpose for aromatherapy fans and anyone who loves essential oil. It is a perfect birthday gift for women,can also as anniversary gifts,christian gifts for girls,mom,kids. come with the beautifulgift boxes you do no need extra.